Certified Inbound professional by Hubspot. 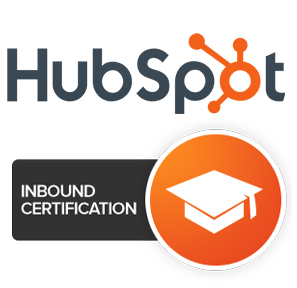 The Hubspot Inbound Certification course features twelve classes that span the four stages of the Inbound Marketing Methodology. From optimizing your website for more search traffic, to landing page anatomy that generates more leads, this course and certification exam covers the fundamentals of inbound. Inbound marketing is an approach focused on attracting customers through content and interactions that are relevant and helpful — not interruptive. With inbound marketing, potential customers find you through channels like blogs, search engines, and social media — unlike outbound marketing, which fights for their attention. By creating content designed to address the problems and needs of your ideal customers, inbound content marketing attracts qualified prospects and builds trust and credibility for your business. The Inbound Marketing Methodology is the best way to turn strangers into customers and promoters of your business, and I am certified and can help you with your business. If you are looking for a digital marketing strategist, remember we are inbound certified. We are experts in Hubspot content marketing and we offer you the best SEO services. PresenceMe is a digital marketing agency in Spain. Spanish SEO consultants to helping you to go higher in the search engine rankings. Trust on our Spanish SEO consultants.